Estate Planning and Estate Administration Lawyer, Jessica Lo, gave an informative presentation about estate planning on September 21. 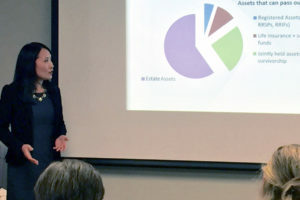 Attendees of the seminar came away with a better understanding of the importance of having a Will, how assets are distributed upon death, and why incapacity planning is something everyone should consider. The seminar was hosted by the WealthWave Capitol Hill office and co-presented with financial professional Vicki Yu.